Get more done with your team. Fini is a simple task management app that helps you keep track of progress, stay in sync, and get things done with your team. Easily track what needs to be done by creating new tasks with a click. Delegate tasks at hand by assigning them to selected users, and get notified of their progress. Collaborate with team members by writing comments in the task conversation thread, and keep things moving forward. 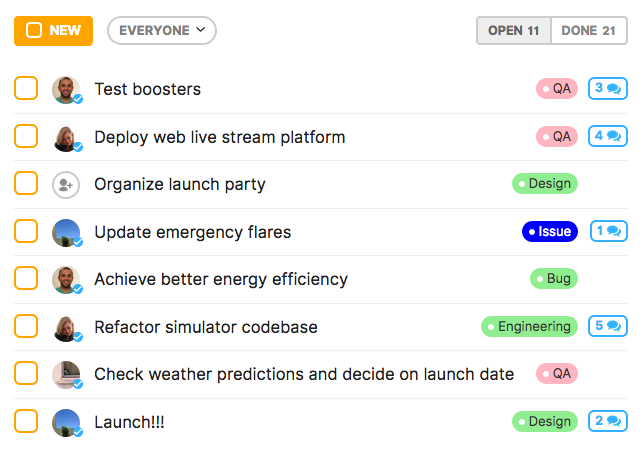 Stay on top of project progress with a dedicated view of what's done, what's left to do and who's doing what. Create separate projects to track and switch between them with a click. Get status notifications for tasks you follow or are active in and never miss a beat. Fini was designed to get out of your way and be as simple to use as possible, so you need focus on nothing but moving forward. How can you be productive when you're waiting on your app to load? We made sure to make Fini blazing fast so the only thing holding you back is how much you can do. Try Fini with your team for 14 days free — no credit card required. Fini is currently in private beta. If you are interested in trying it out with your team, leave us your email and we'll get you in as soon as we have openings!